Defender Fe - Kenya Biologics Ltd.
DEFENDER Fe is a special fertilizer rich in amino acids and iron used for foliar application, fertilizer irrigation and the preparation of nutrient solutions. The product’s iron is quickly assimilated due to being chelated with EDTA and amino acids. tTotally free amino acids with low molecular weight make it an ideal product for use in hydroponics. The provided amino acids also confer biostimulant properties. DEFENDER Fe can be applied by foliar spraying, irrigation and hydroponic nutrient solutions. In soils with pH greater than 7.5 foliar applications are preferable. DEFENDER Fe is stable for at least four years since manufacture date. DEFENDER Fe is irritating to eyes and skin. In case of contact with eyes, rinse immediately with plenty of water and seek medical advice. In case of contact with skin, wash immediately with plenty of water and mild soap. Wear suitable gloves and eyes and face protection. In case of accident or physical discomfort seek medical advice immediately (if possible, show this label). Store in the closed original container in a cool and ventilated area. Keep at temperatures between 5°C and 25°C. DO NOT store for prolonged periods in direct sunlight. Keep out of the reach of children. Keep away from food, drink and animal feed. 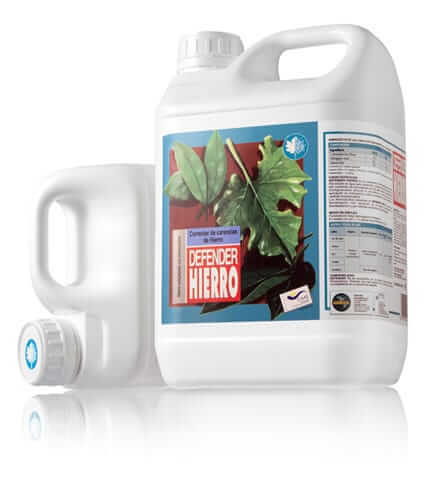 DEFENDER Fe is compatible with most fertilizers and pesticides. It is recommended to do a test before applying the product. Suitable for organic farming. Fruits 5-10 L/ ha/dose 15 days periodicity treatments. 10-20 L/ ha/dose Apply by fertizer irrigation, do 4-5 treatments in intervals of chlorosis declared 15 days and increase the dose by 30-40%. Horticultural crops 4-8 L/ ha/dose Make a minimum of 3 treatments. In severe deficiencies, increase the number of treatments. 8-16 L/ha/dose If irrigation with fertilizers, perform a minimum of 3 treatments. In severe deficiencies, increase the number of treatments. Strawberry 4-6 L/ha/dose Make a minimum of 4 treatments / doses at intervals of 15 days. 10-15 L/ha/dose If irrigation with fertilizers, make a minimum of 4 treatments / doses at intervals of 15 days. Grapevine 6L/ ha Spread within 4-6 treatments, from extended leaf to fruit set at intervals of 15 days. 10 L/ ha If irrigation with fertilizers, spread within 4-6 treatments, from extended leaf to fruit set at intervals of 15 days. Foliar applications: 0,1% with a minimum waste of water of 1.000 liters/ ha. Hydroponic: Spread indicated dosis throughout the cycle.